For over 20 years, our company manufactures and installs inclined elevators for individuals. 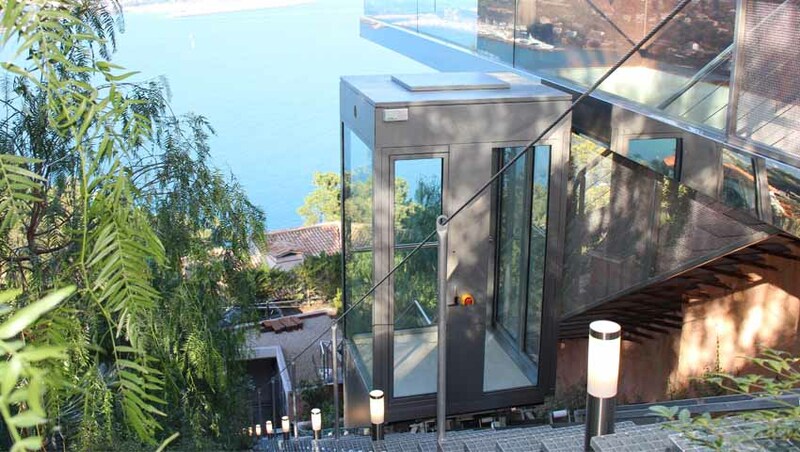 The inclined lift or funicular is the rational solution to your accessibility problems. It allows you to servicing your property while giving to your home an added value. These devices, based on the fundamental principles of the traditional lift, have the originality of movement of a hillside lift. They allow easy movement outdoors, on steep fields with endless stairs and facilitate access to disabled. Our inclined elevators are quiet, built according to European standards applied to lifts (standard NFP 82-400) and perfectly secure. They always fit into the design of your house without destroying the natural environment. All cabins are made to measure and can be customized in accordance with the design of your home and your garden. (standard NFP 82-400) and perfectly secure.